Did the skins that God made Adam and Eve’s clothes from in Genesis 3:21 come from animals or did God just create some new skins? A theologian friend of mine says no animal was killed here and this is not to be used as the first death in the Bible. The whole chapter tells is that immediately after Adam and Eve had disobeyed God’s command (Genesis 2:17) Then the eyes of both of them were opened, and they knew that they were naked; and sewed fig leaves together and made themselves loin coverings. (Genesis 3:7) Adam and Eve had deprived themselves of something that they had before, namely, their prior created goodness which was now a memory and because of their disobedience they became aware of their guilt (Genesis 3:8). Adam and Eve were afraid of their nakedness because of the shame it brought and in Genesis 3:10 their shame of being naked is explained as the consequence of the guilt of sin which is why they hide from the LORD. By their own efforts Adam and Eve tried to cover up their own disobedience (Genesis 3:7) however this was not good enough for God God Himself clothed Adam and Eve because they could now no longer walk before God in innocence (Genesis 3:8). Manmade coverings were by implication pronounced ineffective in dealing with sin. But what was the origin of Gods provision and where did the skins come from? The end product of God’s use of the skins is from the Hebrew words for ‘garments’ kĕthoneth and ‘clothed’ labash which are later used in the Torah’s description of priestly garments (Exodus 28:4, 39-40; 28:41; 29:8). The Jewish priest had to be properly clothed before God in his service (Exodus 20:26; 28:42). But God makes Adam and Eve’s garment out of skin – owr . Elsewhere in Genesis (27:16) Rebekah clothes Jacob with the skins (animal) that belonged to Esau. In fact a quick hunt through your concordance will establish that owr is only ever used of human or animal skin. Since Adam and Eve were the only humans at that point (Genesis 3:20; 1 Corinthians 15:45) and their skin was being covered, the only other source must be the skin of an animal. Although Genesis 3:21 does not explicitly say that the skins were animal, The use of a real animal as the source would certainly explain why in chapter 4 Abel raises sheep – not for eating as man was were vegetarian , but for both clothing and for offering as an animal sacrifice before the LORD; which precedent was set before his father and mother in Eden. If God had used merely an artificial skin look alike – Adam and Eve had no precedent for finding a source of clothing or sacrifice, or any authorisation or need to kill animals for any of these. It is also a plain reading of the text that would make sense to the later audience (the people of Israel) where the skin of an animal was offered to make atonement for sin (Leviticus 7:8). The alternative suggestion our questioner raises is that God made an artificial skin which did not come from an animal, yet it looked and felt like an animal skin. This verges on the sceptics’ claim of a deceitful God. The act of God clothing the man and the woman from an animal would also be a powerful picture of the coming salvation in prefiguring God’s work through Jesus (the woman’s promised seed Genesis 3:15). Adam and Eve were in need of saving from the immediate penalty of sin – death, so God covers their sin by accepting the death of an innocent substitute. Remember it was God who had only recently created the animals and pronounced them ‘very good’– without spot or blemish. God had to do for Adam and Eve what they could not do for themselves. They could not escape God’s Justice. They did deserve death, a penalty had to be paid – both in the short term and for eternity. The New Testament teaches us that because we are descendants of Adam and share in his guilt (Romans 5:12, 15) we need the sinless righteousness of another, Jesus Christ, the promised seed, because our good works are not good enough to cover our debt of sin in the present or for eternity (Romans 5:17; Philippians 3:9; Ephesians 2:8-10). This Genesis 3 picture of a merciful God covering the naked sinner with the garment of righteousness, and salvation through the substitutionary sacrifice of an innocent victim really does point to Jesus Christ’s death for mankind accepted by the Just God who never allows sin to go unpunished. Jesus the Lamb of God took the punishment in our place (John 1:29). Better yet, this same Jesus rose from the dead to show us we could have confidence that when we appear in God presence we will be not be naked and ashamed. We will be clothed in his perfect righteousness..
Was there death in the world before God made coats from skins? At the end of the six days of creation God summed up his creative activity as ‘very good’ (Genesis 1:31). The very good world which God had made is not simply a reference to morals. Verses 29–30 show that “very good” was also a statement concerning the vegetarian diet of man and animals. There was no “kill or be killed” or survival of the fittest in God’s very good creation. Genesis 1:29 states explicitly that the food for humans was to be vegetation while verse 30 tells us that animals also were to eat green plants for food. This means that both animals and humans were vegetarian from the start. Does this mean that plants died? No, the Bible never uses the Hebrew term nephesh chayyah (living soul/creature) when referring to plants but it does when referring to both animals and humans (Genesis 2:7). The concept “the life is in the blood’ is first referenced when man is first given permission to eat animals after Noah’s flood. Genesis (9:1-6) a habit that I am sure soon brought a negative fight back reaction from animals who are recorded as scavenging meat even before the flood and increasingly listed as carnivores after the flood. Furthermore, Isaiah 11:6–9 and 65:17–25 refer to a future state of the earth which seems to parallel the pre-Fall world, when there was no carnivorous activity. Genesis 2 and 3 also teach the beginning of human death. Genesis 2:17 implies the process of physical death of humans came about exclusively as a result of man’s disobedience to God’s command. The grammatical construction is very similar to the way Mosaic law threatened capital punishment – ‘he will surely die,’ or ‘they will surely die’ (Exodus 21:12; Lev. 20:9-16). These were formulaic ways of declaring a death sentence. God was not saying Adam and Eve would die immediately but that death would certainly follow disobedience. This can be seen in the curse man received from God in Genesis 3:19. It is clear from the context of Genesis and the rest of Scripture that death is a wage for sin, and an enemy in God’s very good creation, and one day death will one day be destroyed (Romans 6:23; 1 Corinthians 15:26). 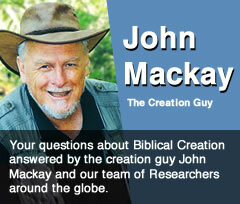 Listen to a great message by John Mackay: The Life is in the Blood. audio CD or MP3 download available from Creation Research webshop. Simon Turpin has a B.A in Theology and Inter-cultural Studies from All Nations Bible College UK (2010) and works full-time for an Evangelical Church in St. Albans. Previous to his studies Simon spent a year as part of a missions team working in North America, India and Germany sharing the gospel. Through his time in the church in England and overseas he saw the increasing need to use the creation message to share not only the truth of the Bible, but the full story of the message of redemption through our Creator and Saviour Jesus.